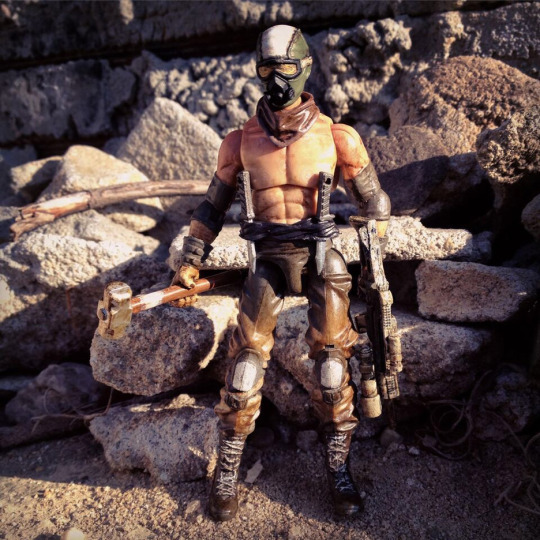 My new Wastelander Bandit custom. I sort of imagine it as something for/from Acid Rain World, so I posted it in this section, though itâ€™s made using mostly GI Joe parts. As if you maniacs couldn't pick out every piece... It's desert Zartan with a Marauder Task Force head and knives, Resolute Tunnel Ratâ€™s neckerchief, a couple other random accessories (i.e. the gun and sledgehammer) and some paint apps. Kind of inspired by the Borderlands games too. Initially I wanted the gun to look even more colorful and Borderlands-like but it just wasn't working, so I went with some bone color and olive green on the gun with a bunch of ink washes and stuff. Did you paint the eyes onto the goggles? Nice. I think the most important part of the AR look is the color palette and you seemed to have nailed it.